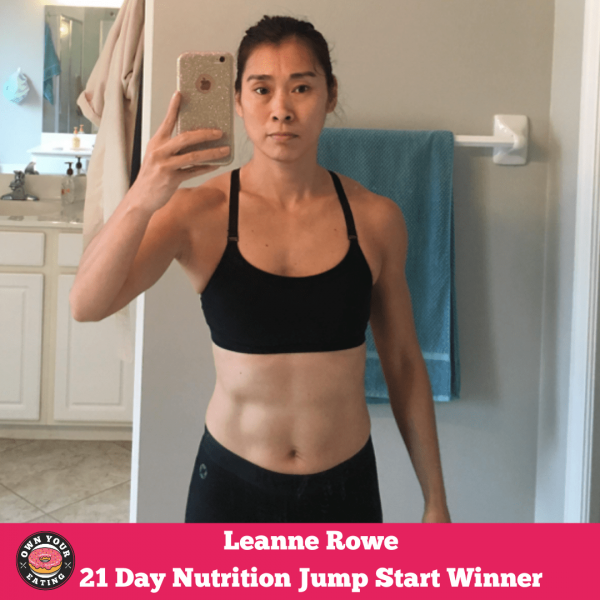 Leanne was one of our winners from our first 21 Day Nutrition Jump Start of 2019! Leanne is a member of North Naples CrossFit and took part in this nutrition jump start to improve her health and get started on the long and slow process of healthy weight gain. Gaining weight without body fat is not an easy feat. It requires both work in the kitchen and in the gym! 💪🏻 Leanne hasn’t been afraid to put the work in at the gym but those gains can only go so far if you’re not eating enough to support muscle growth. Weight moves weight! Tackling the effort that needed to be put into the kitchen became a priority for Leanne and so she signed up for our 21 Day Nutrition Jump Start to ensure she had the support she needed to get started in the right direction. Read on to find out all about Leanne’s experience. How does it feel to be the winner of our 21-Day Nutrition Jump-Start? I feel proud of myself for sticking it out 21 days. Doesn’t seem like a long time but it was for me! I don’t eat very healthy and as I get older, I know it’s going to start affecting my body negatively. I also want to be a good example to my children. It’s never too late to show them you value your health. What changes have you noticed in your body or in general? My goal is to actually put on weight but I noticed that some articles of clothing, like my jeans were actually easier to button. I did not realize how bloated my body was before until that started to happen. Late afternoons, I would always have that “crash” where I just wanted to take a nap. But during the 21-days I didn’t feel that very often at all. My energy level was SO much better. I actually wanted to get up and move around after dinner dishes were done instead of collapsing on the couch! Most importantly, I just feel good about myself and what I have accomplished. It has given me the confidence to keep going. I think I shocked some of my friends with my changes and determination! What was your biggest challenge/obstacle that you have overcome or that you’re working on? The hardest thing for me was tracking in advance. Having the meal plans helped immensely. Once I started putting my food in MyFitnessPal a day or two in advance, it became much easier. Eating out is still tough for me. I usually end up just not tracking so I have to work on that. What’s your biggest takeaway or learning point from this experience? I learned I can feel satisfied eating healthy foods. In fact, I was able to eat more because I was eating good quality foods and I have broken some bad habits in the process. Empty calories from Big Macs and french fries are not worth it. Don’t get me wrong though, I will indulge but as long as I’m doing it sparingly, it’s okay. It’s still better than what I was doing before! Know that you will not be perfect so don’t give up when you’ve had a bad day or bad week. Even if you only have one successful day of the week, it’s one more day than you had before. Get a quality food scale and use the resources provided, like the meal plans, your coach, and the online support. If you have a question, at least 5 people will have an answer and that gives you options. And when you find your favorite dessert, put that in your diary first! Mine is 5 oz of Greek yogurt, half a cup of blueberries, 100g of diced strawberries, 1-2 tbs natural PB, 1 tbs of chopped walnuts, 1tbs honey, 1 tbs mini-chocolate chips. It’s nice to end your day on a high note feeling completely satisfied by your food choices. Whether your goal is to lose weight, gain weight, improve your body composition, energy levels or develop better eating practices, our 21 day Jump Start program will get you started on the right path to achieving your goals. Starting any new task, challenge or habit is never easy, but when it comes to nutrition we know it can be a real minefield of myth vs truth. We’ve done all the hard work in breaking down nutrition habits and principles so that everything you need to know is slowly “drip-fed” to you one day at a time. Day-by day you will learn sound nutrition practices, be provided with helpful reminders and recipes and of course you’ll also have 3 weeks of meal plans to follow to help ease the burden of planning. If you’re not sure whether this program is for you, feel free to contact us for more information.